I have been at Brigade for a month after it opened in September 2011, so just over a year and a half. The first restaurant that I worked in was just after leaving college, it was the 1 Michelin starred” hotel de la Plage” situated on a beach in Brittany, which was an amazing experience as all the produce was so fresh. The last London restaurant was Arbutus in Soho, I have been going there for around 4 years as their food is great tasting and consistent. 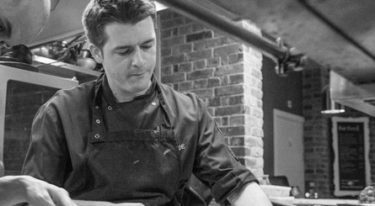 My Biggest influence is Max Fischer who I worked for at Fischers at Baslow Hall, a great chef and good mentor with a great work ethic. My signature dish is “Seared Cornish Scallops with Avocado Puree, Filo and Lime Ceviche Dressing, currently on the menu. Chefs that I admire are Shane Osborne of Pied a Terre and Rupert Rowley of Fischers, Baslow Hall in Derbyshire, both of which I worked for, and Eric Chavot who was at the Capital Hotel. I enjoy the process of cooking and assembling a dish as much as tasting the final result. The sometimes unsocial hours are the only drawback to my job. My Last meal would be Slow Roast Belly of Pork with Roast Potatoes, Vegetables and Yorkshire Pudding. Chefs tip is: If you are putting together a dish with lots of elements, Make sure each element is tested and tasted before you assemble your dish. This eliminates any mistakes in advance, giving you time to correct them.